Blog posts tagged "holy basil"
Adrenal Stress or Just Stress? To get a better understanding of this "syndrome" lets take a look at the roots of this imbalance. Because adrenal fatigue and adrenal stress syndrome are simply the results of the adrenal glands responding to constant stress. So what are these stressors we need to deal with? relationship, etc. As you can see stress is complex comprising multiple factors and sometimes these factors play on each other. Combining lifestyle changes with the use of the Ayurvedic herb Holy Basil which has been traditionally recognized as having a positive effect upon the mind, body, and spirit can result in dramatic improvements to adrenal health. The Holy Basil plant from Indian has been used for thousands of years. It is known to be calming, uplifting, and beneficial for reducing cortisol levels in the bloodstream. Cortisol is one of the main stress hormones and reduced levels of this hormone can mean reduced inflammation, better sleep, blood sugar balance and a general sense of ease and well being. Eco Teas organic & fair trade tea brings us a holy alliance of two celebrated herbs from different wisdom traditions. It is the marriage of Holy Basil of India and Yerba Mate of South America. Each herb in their respective countries is highly valued and widely used as an everyday health beverage. Eco Teas has been importing some of the finest Yerba Mate this side of the equator since the year 2000. Yerba Mate is a widely consumed herbal beverage that naturally contains vitamins, minerals, anti oxidants and the stimulant caffeine. Because the caffeine is part of a vitamin and mineral complex, the stimulating effects are balanced and easier on the body than say coffee. Many tribes throughout South America have drank mate for thousands of years, this beverage is common in Argentina, Brazil, Uruguay, Paraguay as well as Chile. The South American gauchos, cowboys refer to it as a liquid vegetable. With its deep green color and abundance of chlorophyll and nutrients it is somewhat akin to drinking a vegetable. And, Holy Basil comes to us from a deep long ancient tradition, it hails form the annals of Ayurveda the 5,000 year old medical science of India. The practice of Ayurveda is the oldest continuous coded medical system in existence and among the Vedas, Holy Basil ranks supreme. It is such a special and revered herb that the three varieties have the distinction of being named after the three major Hindu gods, Krishna basil, Rama basil and Vishnu basil. The Vedas believed that the consumption of Holy Basil prepared the mind for enlightenment. A high statement but after 5,000 years they must of had significant trial and error and I agree their conclusions are darn near correct. 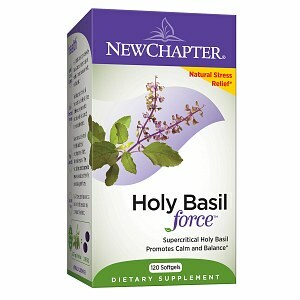 Holy Basil has a high distinct and modern science is beginning to uncover some of the magic of this plant. A main action of this plant is its ability to regulate the stress hormone cortisol. There are special chemical compounds in Holy Basil which do this. Reduced cortisol levels in the blood leads to greater calm in the body. It is safe to say a lot of people have elevated stress hormones, these elevated hormone levels lead to imbalances in blood sugar, sleep and digestion. Holy Basil also has natural anti-inflammatory compounds helping to smooth the body and aid in all manor of bodily functions that are affected by inflammation. Combining these health benefits with the nutrition of Yerba Mate results in a tasty mildly stimulating beverage that aids focus, concentration and clarity. 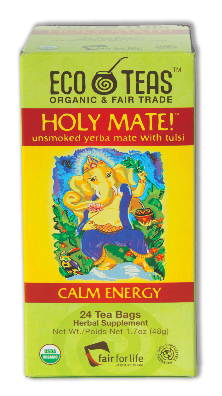 Try a cup of Holy Mate and feel the calm energy as it takes you through your day with the wisdom of South America and Vedic herbal tradition. Holy Basil, Tulsi the Queen of Herbs as it is known in India, is a revered and treasured botanical. In Vedic medicine the 5000 year old medical legacy of Indian Holy Basil is said to help balance the chakra and open the energy system to an enhanced flow of prana. This amazing supplement can easily be a part of anyone's health routine. I say this because it has many important compounds which can benefit human health. First: Holy Basil leaves are regarded as an anti-stress agent. Recent studies have shown that the leaves afford significant protection against stress. Even healthy persons can chew 12 leaves of basil, twice a day, to prevent stress. We live in some really challenging times and we are being tested in stretched in many ways by a variety of factors. Whether its our own personal challenges, or challenges from the outside, such as crazy weather or the economy. We are being asked to deal with a greater and greater levels of stress and still maintain a balanced life. One of the amazing attributes of Holy Basil is that it helps to take the edge off, it softens those tense feelings that get stuck in the musculature and start to disturb us mentally. In India they have been using it for 5,000 years, they say it helps the mind reach enlightenment . . .
*The information in this blog post is not medical advice and this information is not intended to diagnose, treat, cure or prevent disease.